Shaving with a straight razor is for those with a passion for the art of shaving. It represents the pinnacle of manhood and manliness. However, with shaving being such a personal thing, everybody has a different preference. Finding the right one for you can be hard work. Thankfully, we have done all the leg work to provide you with an interactive and comprehensive guide of some of the best straight razors on the market today. The dollar signs ($) represent the price. You will be able to pick up anything with one or two dollar signs for under 100 dollars. Straight razors are commonly known as cut-throat razors as they have a long, curved blade. Having reached the prime of their usage in the 20th Century, using one is considered to be old fashioned. Straight razor shaving has recently become popularized due to a scene in the recent James Bond film Skyfall, remarking in regards to shaving with a straight razor that “sometimes the old ways are the best.” Most of the blades for these shavers today are constructed from stainless-steel, although in the past (and still occasionally today) they were made from carbon-steel or ivory (the use of ivory has been discontinued, but fossil ivory can still be used). Normally, the blade of this shaver is able to fold back into the handle to protect the user from harm. Despite being old fashioned, thankfully, they are still produced today. With skill, a decent straight razor offers the closest possible shave due to increased control and a larger blade. Straight razor shavers benefit from decreased skin irritation and increased comfort whilst shaving. Maintaining the blade is also relatively easy as they are easier to clean. Whilst shaving, the blade acts as a scoop so needs rinsing less often than safety razors. A well maintained blade can last for decades so you won’t be continually forking out money or wasting disposable blades after the initial investment. This superior shave represents the height of manliness and using one is just, well, cool (have you seen Skyfall?). First of all, you need to decide a price range. Like everything else, with straight razor shaving, you get what you pay for. Unless you are a beginner looking to try out your first razor, or unless you are on a tight budget, we would normally recommend you spend no less than $60. Doing so invites a low quality blade with imperfections that could cause tugging or injury. The blades may also be constructed from softer metals. Next, decide what blade material you would like. Most blades are made from either stainless or carbon steel. Stainless-steel gets duller quicker but is more resistant to rust, whereas carbon-steel blades are sharper (and will stay sharper for longer) but require you to take extra steps to protect them. Once you know what your price range is and what blade construction you want, you can begin browsing the available shavers. You may at this point also wish to consider what material the handle is made from, as this will affect your grip and control over the shave. More expensive razor handles tend to be constructed from woods, whereas cheaper ones tend to be constructed from plastic and resins. Any one of the above shavers would be a great buy – much of it boils down to personal preference. Below is a collection of our personal favorites this year from each price band. At the higher end of the market (and priced accordingly) is the Feather DX Folding Pearl Handle Razor from the Japanese company, Feather. We feel this razor is the best. Feather produce some excellent, high quality razors. The blades in this particular razor are replaceable and there is a choice of 4 available, depending upon your beard type. Having a replaceable blade means that you still get all the luxury and quality of a great straight shave but without the need to expend effort maintaining the blade. The Feather DX also features a heat resistant handle. Although there are some razors with a nicer body (made out of wood, for example), this razor is backed by user reviews from shaving lovers and professional barbers alike. It has an astonishing rating of 4.8/5 so you know it offers a great shave. The good part is that you are able to have an exceptional shave without having to spend all of your time keeping the blade in mint condition (as you can just replace it once it becomes too dull). It comes shave ready. Click Here to See Pricing, Ratings, and Reviews on Amazon. Dovo is a German company founded in 1906. It is famous for producing high quality shavers (amongst other things, such as scissors) from its two subsidiaries Merkur and Solingen. This particular quality shaver from Dovo is from their best quality, half hollow range. This means that you get a light weight, high quality construction and a stylish design. 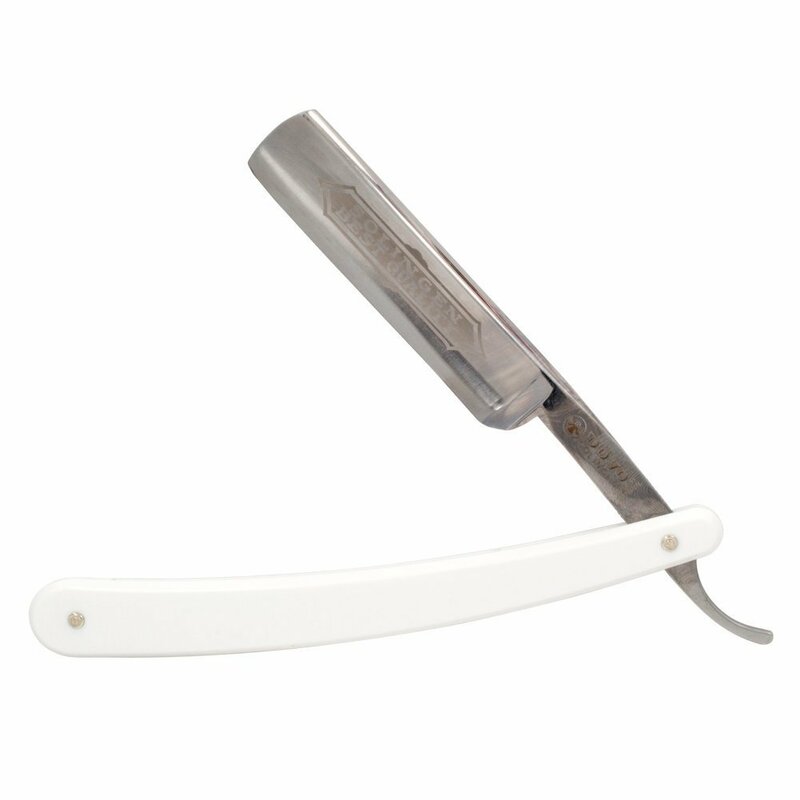 It features a nickel plated carbon-steel blade with a 5/8” rounded point for that perfect shave. The handle on this shaver is constructed from white synthetic celluloid. This device is rated highly by Amazon users (which is not surprising given its Germanic quality). It is priced reasonably well too. With a brand such as Dovo you cannot really go wrong, whichever of their blades you buy. It comes shave ready. Like its more expensive cousin, the Feather DX, the Feather SS offers replaceable blades and heat resistance at a much more affordable price. This means that you still get all the luxury and quality of a great straight shave without the need to expend effort maintaining the blade and without the need to fork out several hundred dollars. Again, like the DX, the SS comes with stainless-steel blades and a silicone resin handle. It still looks the part and offers a fantastic quality shave without all the hassle of honing and maintaining the blade that you would have with other brands. The shaver comes highly recommended on Amazon and is very affordable. Produced by Haryali Fashion (a company based in London, England who a relatively unheard of but they are starting to produce some very high quality products), you can own this stylish shaver with a 6” Rosewood handle for under 100 dollars. A handle such as this is normally found on a straight razor that is far more expensive. It comes with a 3” carbon steel blade so that you can get the closest possible shaver. As I write this it currently comes with a free carrying pouch, making it the ideal inexpensive gift. This shaver comes with excellent user reviews on Amazon and for the quality and price; it is easy to see why. For a razor that looks this good you would normally have to pay several hundred dollars. The blade does not come shave ready so it will need honing before use. This Straight Edge Razor from Utopia Care is a very cheap entry level shaver with disposable blades and a foldable handle mechanism for safety. In fact, for under $10, it comes with 100 individually wax paper wrapped Stainless steel blades. Utopia allows you to enjoy the feel of a traditional shaves and take it back to basics without the need for honing and maintenance. Its disposable system makes it very hygienic and it is great for beginners. This is by no means the best straight razor out there but it certainly deserves a mention – it is a no thrills shaver and does not come with a good quality decorative handle, but it does the job and it does the job well (according to the Amazon user community), especially for its price. In fact, it has scored very highly on Amazon and has received hundreds of reviews. If you are just looking for something to do a good job for a very reasonable price, this could well be the one for you. Really appreciate this great round up of straight razors. Thanks.